musicGuru is a music management utility allowing you to rename, move, copy, record to CD/DVD your songs without getting your collection disorganized. 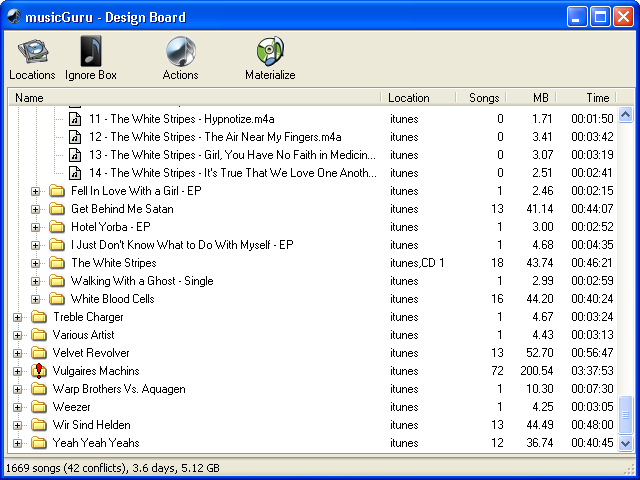 The central piece of musicGuru is its Design Board. The Design Board is a virtual workspace that lets you safely play around with your music collection's structure. No changes are actually made to your collection until you decide to materialize your design. ...... No changes are actually made to your collection until you decide to materialize your design. - Rename your songs automatically using their ID3 tags. - Archive your collection to CD in an organized way. - Archive only songs that you haven't archived yet. Qweas is providing links to musicGuru 1.4.1 as a courtesy, and makes no representations regarding musicGuru or any other applications or any information related thereto. Any questions, complaints or claims regarding this application musicGuru 1.4.1 must be directed to the appropriate software vendor. You may click the publisher link of musicGuru on the top of this page to get more details about the vendor.